No matter how great your resume, cover letter and portfolio are and regardless of how well your interview went, your job’s not over yet. Keep your name, and the positive impression you’ve made, in front of the hiring decision-makers until you have the job offer or learn it has gone to someone else. Write your thank you letter the day of your interview while all the information and feelings are fresh in your mind - and in your interviewer’s mind. Your interview follow-up thank you letter is your chance to remind the interviewer why you think you’re the best candidate for the job. You can add information that might not have been covered during your interview, explaining how it might be of interest in their considerations. The following sample is only a suggestion. Write your letter so it sounds like you - the way you spoke with the interviewer - adding your questions or interview "repairs". Thank you for taking time to speak with me today. It was a pleasure meeting you (and names of other people you met with or were introduced to during your visit). I am now even more enthusiastic about filling the position of (job title) with (name of company). Based on your requirements for an ideal candidate (insert a few specifics), I am highly confident that my proven abilities to (enter two or three skills) will be a valuable asset on your team. 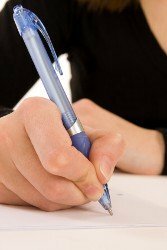 Believe it or not, some organizations have a handwriting analyst look at your signature if you are among the finalists for a position. Don’t change the way you usually sign your first and last names, but be sure to use a firm stroke. If you receive the dreaded “thanks, but no thanks” letter, what next? The most obvious answer is that you go back to square one and that may be what you end up doing. But there’s nothing that says you have to take “no” for an answer and let it go at that. Of course you can’t demand any job. But you owe it to yourself to be sure you understand why you weren’t hired so that if you made a mistake(s), you won’t repeat it. Show your initiative and determination again by placing a “feedback request” phone call. Here’s how it will work. Wait until any anger or frustration has subsided and you are calm, composed and open to advice. Speak to someone who actually interviewed you – the closer to the ultimate decision-maker the better. How did you reach your decision? What advice would you give me for my next application? Never argue about the decision, even if they say something like you came across as too shy, too bold, etc. Instead, you might say something like “that certainly wasn’t my intention”. Thank the person you’re speaking to for their time, courtesy and feedback. Be sure they know you hold no hard feelings. Of course, if you’d rather not make a feedback request call (just kidding), you can always take your frustration out by writing a letter you’ll never send to anyone. But just writing it will make you feel better! Thank you for your letter of April 1st. After careful consideration, I regret to inform you that I am unable to accept your refusal to offer me a position at your firm. This year, I have been particularly fortunate in receiving an unusually large number of rejection letters. With such a varied and promising field of candidates, it’s impossible for me to accept all refusals. Despite your firm’s outstanding qualifications and previous experience in rejecting applicants, I find that your rejection does not meet my needs at this time. Therefore, I will assume the position for which I interviewed starting on the 1st of August. Ignore the interview follow-up process at your own peril. If you do, you’ll probably fall off that company’s radar screen. Meanwhile, there will be a few other candidates who will stay in interviewers’ minds because they’ve taken these few important steps!